Always a favorite for gifts to friends and family back east, these small, colored plastic miniature ice scrapers poke fun at the fact that Arizona doesn't suffer from the inclement weather that other places in America do. They are available in a variety of colors, which are shown above. Frequently, shoppers wish to purchase more than one Ice Scraper. As long as the shipping address is the same, we can work with you to keep freight charges down. 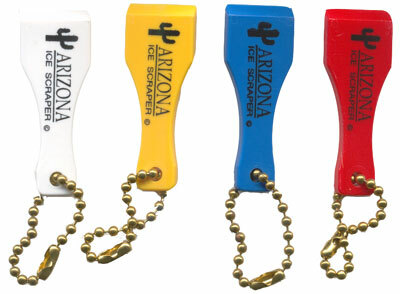 We sell Arizona Ice Scrapers in packs of 5, 10, 20, 25, and 50 units. The percentages of a given color of ice scrapers in a package will fluctuate. This is due to the supplier and cannot be easily controlled. No package deal will contain exclusively one color, however.